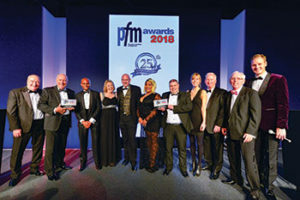 The awards, created by PFM Magazine recognize companies and suppliers that forge effective partnerships within the Facilities Management industry. The awards were held at a glittering black tie event at The Brewery in London and this category award was presented by the BAR’s Commercial Moving Group chairman Nigel Shaw. The teams from Pickfords Business Solutions and VINCI Facilities were delighted to receive the award, which is a reflection of the long standing partnership forged between both companies. The award followed a year when VINCI Facilities and Pickfords relocated Convent Garden’s flower and vegetable markets, collaborated to find a national, multi-site digital asset verification solution and helped clients achieve their sustainability goals through Pickfords’ furniture recycling and reuse service.